We just celebrated Independence Day in the US, and this year it occurred to me how fortuitous it is that the Founders did not do their treasonous work in the dark and cold of a winter evening. Though it was surely the farthest thing from their minds as they abandoned appeasement and pledged their lives and fortunes on that stifling July day, I cannot imagine that the event now typically celebrated with picnics, beaches and barbeques, coolers of iced beer, and reunions and rocketry would be commemorated by much more than a few urban fireworks displays on your typical iced-up January evening. As the picnics wore down, and the rocketry and firecrackers quieted, I got to thinking that the Tom Collinses and other tall drinks I had been sipping through that long afternoon and evening may not have been all that far from the refreshments that John Hancock, Thomas Jefferson, and others of the Continental Congress may have searched out when their work was done on that stifling July 4 in 1776, as they ratified the final edits of America’s Declaration of Independence and cemented their status as enemies of the Empire. I’ve yet to find mention of what the Founders really did after leaving Independence Hall, but at such an auspicious moment on a hot Philadelphia summer day, it stands to reason that some, at least, adjourned to their local clubs or taverns and raised a cold glass in relief, celebration, and perhaps trepidation. They may have indulged some good New England ale, perhaps. But very likely, it would have been Punch. Gin, rum, or brandy, Punch was the preeminent social drink of the 18th Century. The Founders lived at the zenith of the age of Punch, and an elegant age it was. What they would have been drinking was the flavorful and potent precursor of what we know today as the cocktail. One of the best punches of the era, one that many of the Founders may have known, was the Philadelphia Fish House Punch. This particular Punch was invented by a Philadelphia rod and gun club called the Schuylkill Fishing Club. They seem to have been an amusing group, structuring their club along the lines of colonial, and later state, government. (According to David Wondrich, they even went so far as to elect a coroner, which sort of gives one pause.) Their goal seems to have been to provide a getaway for themselves where they could smoke, fish, hunt and drink to their hearts’ content, and by all accounts, they succeeded. There are various stories of Fish House Punch’s origin. One story suggests it first appeared in 1732, with the forming of the club; another, that it was formulated as refreshment for a 1740 Christmas party, in order to enliven the ladies. But the formula was kept secret, or at least not publicized, so it wasn’t until Jerry Thomas published a version of it in his Bar-Tenders Guide more than 125 years later that it came to be generally known. The predictable result is that we have many recipes competing for authenticity. 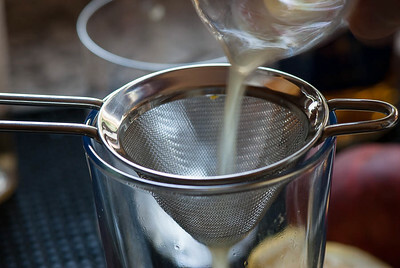 Differing mainly in proportion and technique, they agree generally that Fish House Punch includes rum, cognac, peach brandy, lemon juice, sugar and water. And most recipes, especially the early ones, are designed for mixing Punch in what Wondrich refers to as “large bore” proportions—Punch was a social drink, and was mixed up gallons at a time, and usually presented in elegant “flowing bowls” that often became the locus of conversation at social events. Mix all ingredients and serve over ice. Top up with the water or club soda. Optionally garnish with lemon or fresh peach slices. As for the formula itself, I have seen Fish House Punch recipes that call for two parts Cognac to one part rum, instead of the other way around; that works, and is a nice drink, but the rum version has a bit more character and oomph, and I recommend you try it rum-heavy first. Peach brandy is a conundrum. “Real” peach brandy didn’t survive Prohibition, at least not in the U.S. There are some respectable peach liquours on the market, but they tend to be relatively dry and quite lightly flavored compared to the brandy that was probably available at Shuylkill, and to Jerry Thomas. The recipe here calls for a full ounce just to get some peach flavor going in the drink; originally, it would only have been a teaspoon or less. In my opinion, anything other than Smith & Cross leaves the punch lifeless and unremarkable. Jamaican rum as a class is strongly flavored, and the Smith and Cross is an excellent choice for this drink because the flavors will hold up even after your ice has melted away to nothing. It was a revelation to me that it could stand up to such extensive dilution. Light rums will not survive dilution as well; sweet, or spiced rums aren’t a good match either. I think it’s the big-flavor funkiness of the S&C that makes it work well in the Punch world, but if that’s not to your liking, then Myers’s will make a good Jamaican substitute—with perhaps a bit less lemon, and a bit less dilution. As for the soda, it’s not totally inauthentic—some Punch recipes included Champagne from time to time—but the original Fish House Punch would have been diluted with water, specifically with great blocks of ice in the punch bowls. I prefer a combination—the ice will melt in its own good time, but I enjoy the extra brightness that a splash of soda brings to the glass. I owe my interest in Punch to Wondrich; I had never given it much thought, and certainly had known nothing about its potent, delicious, sociable, and elegant character until I read his 2010 book Punch . Imagine Fish House Punch made with lime, and Daiquiri is in easy reach. Or made with gin, and it’s very nearly the Tom Collins. This is a great drink, the proto cocktail, and a delightful way to lighten your thoughts whether you’ve spent the day pledging your future and your life, or if you’re just waiting for the fireworks to start. “Punching out with the Founding Fathers” at cold-glass.com : All text and photos Copyright © 2012 Douglas M. Ford. All rights reserved. I’ve been debating on a punch to serve at a summer party: the P.F.H. Punch is one of the contenders, as are the Chatham Artillery and the Barbados Gin Punches. We’ll see which one wins out. 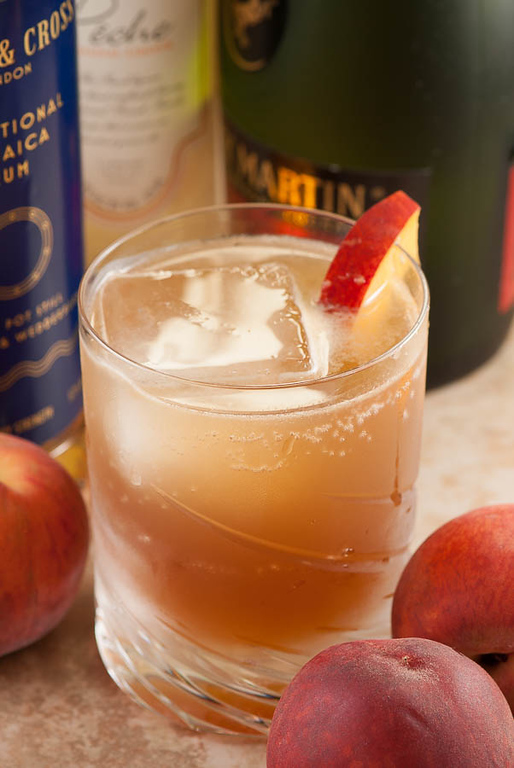 Have you tied the “real” peach brandies that have emerged recently? I’ve yet to locate/order Kuchan or Dutch’s, and there’s little hope of trying the Mt. Vernon distillery’s handiwork. I wonder how they would hold up in the Punch. No, I haven’t tried the Artillery Punch yet. But we have a batch of hot weather coming up, and I’m finding that Punch is an excellent way to deal with such conditions, so I suspect I’ll be diversifying my Punch menu Real Soon Now (as we used to say in the software business). nice blog! give me feedback on my recipes pls ! A drink worth mixing, I’d say. You’ve done a great job of returning a little masculine respect to the modern emasculated punch drink. What I remembered as punch, until I read Wondrich’s books and began to look at the history, was essentially a big bowl of red juice, made up of a mix of various brand name canned juices. Often alcohol-free for all the kids attending whatever social we were attending. Useless. It made the modern cocktailian’s interest in the historic drink seem bizarre to me. But something got me interested, and I have been delighted to learn that in the old days, Punch was serious business, dangerous and delicious—and expensive! Same here. “Red.” Your photo of a very serious pale, orange drink caught my attention. I’m glad that you brought this “serious business” back into the light. It sounds amazingly delicious. No wonder the Founding Fathers were so clear in their thinking. If they were drinking this stuff there would be little room for any adverse interferences. Great writing, you turned an ordinary recipe into an adventure. Thanks, Joe, you brighten my day. Well, now, haven’t you written just an excellent primer for those of us who have so far been punchless? I had Chatham’s while in Savannah, that oh-so-civilized city of the “traveller” drink but it seemed a bit limp-wristed. “Punch for two,” civilized indeed. I’m going to have one with an imaginary friend just as soon as possible. I’ve been enjoying punch with my “imaginary friends,” too. That’s a fine way to think about it. Very cool. I had a few beers (more than a few) from Yuengling a brewery only slightly younger than the country itself. I also enjoyed a few ciders; which were far more popular than beer back then and would have been the beverage of choice at most meals. Legend has it that Laird’s Applejack in NJ uses the same recipe George Washington used to make his personal stock of the stuff. As I read your section about Smith & Cross, I remarked to myself that Myers might be an acceptable substitute, so I was glad to hear you mention it at the end. Appleton Estate V/X or Reserve also wouldn’t be untoward, dare I say. Then again, I’m getting irritated with all the trendy passion about Smith & Cross… it’s a great rum, but it’s not singular. It’s definitely a necessity to use rum of a funky Jamaican style and nothing else, as you said. You’ll see a bunch of other old Punch recipes calling for Batavia Arrack, whose pungent flavor would be akin to the same in Jamaican rum. I suppose on that line, you could almost view Rhum Agricole and Cachaca to be suitable cane spirits for punches, though I’ve never seen those prescribed. I did experiment with Appleton 12; the punch it makes is good, but it doesn’t take to dilution as well as the S&C. But that’s a pretty interesting idea, the rhum agricole for punch. I’ll have to give that a try soon. Great post (and the Artillery Punch noted above is good stuff). We love making punch but the recipes are always a reminder of how boozy they can be…but they do taste good. What an interesting post! I just made a vat of sangria for our bbq, but I’m going to try the punch next year instead. Do you know a good recipe that makes 2 or 3 gallons? I bought one of those big glass jars with a spigot from Pottery Barn which holds a bit less than 2 gallons. You’ll likely have to modify it a bit, depending on whether your plan includes adding the ice to the 2 gallons container, or to the serving glasses. Have fun. Thanks. I will try it out before the summer ends! Thank You..what a Great post….Yes our Founders would be proud!! Exceptionally nostalgic post. They well knew what lay ahead in the war to gain independence. After the signing I’m sure they required a stiff drink! They had to sleep well, for they had declared a new dawn. Great post. Congratulations on freshly pressed. The idea of Founding Fathers punch just sort of tickles me in the same way as Election Day cake. I’m glad I saw this post. Well as a Canadian that sounds tastier than our founding punch. I don’t know if we have one but if we do it is likely maple flavoured and that’s not on. Cheers! Funny you should mention that. I was wondering on Canada Day if there is a “Founders Punch,” or any other commemorative cocktail for that day. Since half my family is Canadian, I’m sure I’ll have to do some research on that one day. Thoroughly enjoyed reading your post. Congratulations on being “Freshly Pressed”. Thanks. Freshly Pressed brings a lot of new readers, and it’s always a lot of fun to hear new voices here. Congratulations on making Freshly Pressed! These are interesting cocktails you have here. Thank you, it’s great to know that readers enjoy my articles. i’m making this, THIS WEEKEND !!! Will give you my review ;-) Can’t wait!!! …as a cocktail enthusiast, i just want to thank you for sharing the recipe, and for writing up a great post. I look forward to hearing the result. I love the sound of this – I’m always looking for new and interesting drink recipes. How can you go wrong with brandy, cognac, AND rum? Love the peach garnish! Here in Minnesota, it’s nearly impossible to get good peaches. They only ship us two or three of them each summer, so you have to keep your eyes open. (The rest are rotten by the time they get here—or more likely still rock-hard, never to ripen properly.) I really lucked out on the timing for this photo. And I ate the rest. Um YES please!! sounds amazing! I am definitely following this blogger for some great ideas for my favorite recipes section! Cocktails….why didn’t I think of that sooner? I bet they did drink Punch! I mean, these were smart, hard-working men after all. Who doesn’t want to go out for a drink and socialize after successfully closing a deal? Especially one that affects a whole country and changes the world. I mean, these men seem to have visions that this new government would shape a nation for generations, so there must have been a lot of toasts after all these all-nighters. It’s a Constitution, Cheers!! Anyway. that punch looks delicious. I’ll have to try that recipe at my next rooftop barbecue, or at next week’s party gathering for the viewing of the Bachelorette finale. ;) Thank you!! Ooh, I’m having a summer wedding, and I may have found my perfect drink. Thanks for testing it out! I’ll have to send it to my sister. Congratulations to you; I hope this works out well for you.